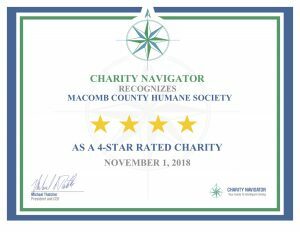 On November 1st, the Humane Society of Macomb was awarded Charity Navigator’s 4-star rating for demonstrating strong financial health and a commitment to accountability and transparency. According to Charity Navigator, a 4-star is the highest rating given. Only a quarter of the registered nonprofits evaluated by Charity Navigator achieve this 4-star rating distinction. Charity Navigator was founded in 2011 and is currently the largest charity evaluator in the United States, evaluating over 9,000 charities and providing basic information for 1.5 million nonprofits each year. They evaluate charities based on their finances, accountability, and transparency. To check out the full report by Charity Navigator, click here.